Strong and Lean. Healthy and Wise. Are you interested in building a badass lean and muscular body? A body where you can be equally proud of how strong, powerful and exceptionally good-looking you have become. This physique is characterized by having a dense, proportionate muscular development while maintaining a solid level of definition. It is the kind of body many Hollywood actors have in movies and is regarded as highly desirable by men and women alike. That is exactly what Greg O’Gallagher promises with his Greek God Program. With his brand Kinobody, Greg has been very popular in the online fitness space for some time now because of how many people are having success people with his programs. Vanity aside, the philosophy of Kinobody is not only to look great. The Kinobody philosophy you will find in any of Greg’s programs is to feel and be great, live a healthy but flexible lifestyle that is about enjoying life to its fullest and not being a slave to the gym. To me, that is a great and refreshing approach in an industry that often tends to go to extremes in what you can or cannot do. It is a detailed workout and nutrition program that is designed to teach you how to quickly transform your body into looking like a GREEK GOD! The program uses a minimalistic approach to working out and only requires you to train 3 days per week for approximately 1 hour each session. The main idea behind the program is to build proportionate muscle while gaining as little fat as possible. This way you can look good all year around. Greg uses examples to illustrate how he defines the look of a Greek god. He mentions some popular actors that have this physique in movies or TV-shows. These men all have impressive physiques. The low levels of body fat combined well-built and proportionate amount of muscle make a highly desirable body. The large shoulders and wide back combined with a slim waist create that V-shaped torso. This kind of body simply looks awesome! It is no wonder that is what most men want. The Greek God Program is intended for men only. It is for guys who want a strong and great looking body without having to spend many hours in the gym (the program only requires 3 sessions for 1 hour each). Beginner and intermediate lifters will benefit the most from this program. But also guys who haven’t focused on heavy lifting before or haven’t had great success with it. Greg O’Gallagher is a young man who has already built a small online fitness empire. One major reason for that achievement is he provides quality and science-based content and that his programs simply work. Greg has been very active on social media especially youtube where he gives a lot of advice and content for free. He views fitness and nutrition as a way to enhance and complement life. Not an obsession. He is a big advocate of intermittent fasting and skipping breakfast. Greg has an interesting story and if you want to know more about him you can check out my in-depth review of Greg and Kinobody. What Do You Get With The Program? The program and the bonus contents are hosted on the online platform teachable. This makes for easy access and navigation. Upon purchase, you receive immediate access. The program is divided into sections covering important topics like how to set up your training, the workouts and their different phases, nutrition and tracking progress. All workout routines are both explained and illustrated in different videos. The videos are good and illustrate how to properly perform each exercise with good lifting technique. Greg does a great job of explaining everything well in the program. He explains all the different ideas and concepts in detail but with laymen terms. Even a complete beginner should have no difficulty understanding. The Greek God Program also comes with additional bonus guides and FAQ Materials. As of November 2017, these include three additional workout routines, podcasts and access to the Kinobody exercises tutorial Vault. The exercise vault is pretty cool and has videos of exercises. Greg shows how to properly perform all his favorite exercises (which are many). With the program also comes access to a private forum and it is also useful. Read more about the program on the official site here, and see for yourself how awesome the transformations of other people are. 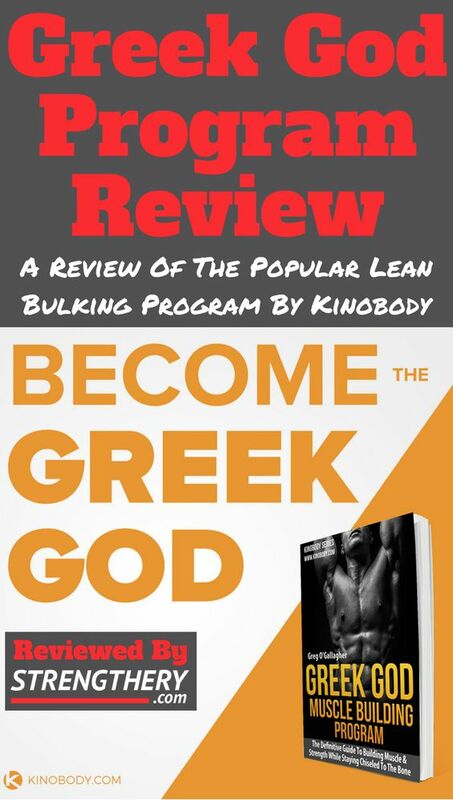 Does The Kinobody Greek God Program Really Work? Perhaps it seems too good to be true, but I am serious when I say 1000s of people have had success with this program. There are so incredibly many positive testimonials and it is completely normal people like you and me. You can read more about my and other people’s experience below, but first I want to cover how the program works. The Greek God Program works by combining a smart nutrition protocol together with mostly very heavy weight training but with few working sets. The nutrition approach is essentially a lean bulk where you cycle calories while also doing intermittent fasting every day. This has proven to work very well for many people! Regarding the workouts, only a small selection of exercises are used. These have been hand-picked for resulting in the Greek god physique as quickly as possible. By focusing on lifting very heavy, it is possible to get a great stimulus to the muscles that promote growth even though you are not performing many working sets. In other words, it enables you to become incredibly strong and muscular without having to spend a lot of time in the gym. Training 3 days per week for about one hour is enough for rapid muscle growth. The Kinobody greek god workouts do not only include heavy training. Actually, the program combines different training methods. The Greek God Program is built on some solid training and nutrition principles or concepts. Heavy compound lifts require the maximum muscle recruitment. These involve multiple muscles and joints. Heavy compound lifts are without a doubt the best for strength and muscle gain. With reverse pyramid training, you perform your heaviest working set first, and then lower the weight and increase repetitions on the subsequent sets. The reverse pyramid is a very intense training method where you come closer to your maximum lifting potential compared to other methods. Lifting heavy in the 5-10 rep range is optimal for gaining strength and muscle. This promotes growth to muscle fibers (myofibrillar hypertrophy) and is what will give you hard and dense muscles. The Greek God program progression model involves using microplates / fractional plates. These are very light plates. Beginners and intermediates can rarely improve more than 1% from each successful workout. By using a smart progression model and adding just a little extra weight, you avoid adding too much which will slow or stop progress. With a 2-day split, you only have two different workouts. As you train 3 days per week you will each week be doing the same workout 1 or 2 times. Hitting the same muscles with heavy compound lifts on average 1.5 times per week is great for beginners and intermediates as they have a large muscle growth potential. (see my article on how much muscle you can gain). Doing heavy lifts 3 days per week is optimal for recovery (at least for a large majority of people). Basing all workouts on heavy lifting for 3 days per week also enables you to focus on many other things than the gym. That is fine because building your upper body is typically slower than the lower body, and you can make up for it at a later stage. Additionally, most people want to keep the size of their legs under control. If this is the look you want then this program is for you. To become really strong, you need to combine different training principles and methods. The program does add different methods but focuses on what works the best. By eating more calories on training days and less on rest days, you take advantage of the peak in protein synthesis and depletion of muscle glycogen. Basically, by cycling calories, you provide more calories when muscle growth and recovery is high and fewer calories when it is more likely to be converted into fat. Greg is a big advocate of intermittent fasting, so it is only natural that it would be an important part of his programs. But, you don’t need to do it. Intermittent fasting has a large number of health benefits and could positively affect muscle growth because of changes in hormone levels. I think most people will find that it helps keep their calorie intake under control and that it is its biggest benefit. – The program does what it says. It promises great and fast results and delivers! – The training style requires you to lift close to your fullest potential. This works great, but if you are a complete beginner you could injure yourself. Pay very close attention to your form! I started the Greek God program more than 2 years ago now. This program and the teachings of Greg was a big part of why I was successful with my change to heavy weight training. Before my change, I worked out a lot. I went to the gym 4-5 times a week spending sometimes up to 10 hours in total. But I never got the results that I wanted out of my training. Because I wanted to change this and also spend less time in the gym I did a lot of research on how to train smarter and get better results out of less training. I put what I learned into action and then I came across Kinobody. His Greek God Program resonated with what I had learned and what I wanted. Because of all the positive feedback he had got I decided to give it a try. And I never regretted it. Here are two photos of me with about 2 years in between. The first photo is of me when I was just starting out with the program. The second photo is of me when I decided to start the superhero bulking program. You can check out my review of that program here. Keep in mind that I did make a ton of mistakes in between in nutrition. I managed to get relatively lean, then fat, and then lean again. I also injured or “reinjured” my legs. 4-5 years of doing CrossFit have taken a toll on my body. Before greek god. Photo from November 2015. As I mentioned above the program has literally been bought by more than 30,000 people and the results people are getting are really awesome. Here are some transformation photos I found of other people. To be perfectly honest, these transformations you see here is really just a very small tip of the iceberg. As I pointed out above, this program has literally helped tens of thousands of guys all over the world build impressive physiques. If you want to check out more awesome transformations there are a bunch of them on the product page on Kinobody.com. 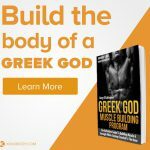 The product page actually covers the Greek god program surprisingly in-depth, and if you didn’t check it out before I would recommend doing so. It got a lot of useful information. The program really works. It promises great results and delivers! The smart nutrition protocol combined with the deceptively simple yet very powerful training style works wonders. If you want to build a strong and amazing body without enduring many hours in the gym, then the program is definitely worth your money. If you are a complete beginner lifter, then starting out with the Greek God Program will put you light years ahead of other beginners. Just pay very close attention to your form. If you suspect something is wrong the double check. Don’t lift with your ego. If you have been putting in a lot of effort in the gym without seeing great results, then I can guarantee things will change for the better if you start this program. All in all, The Greek God Muscle Building Program is an incredibly powerful program for beginners and intermediates. It has sold around 30.000 copies and the positive feedback and testimonials are immense. If you are convinced now and want to join the 1000s of people who are building their dream body, then here is how you can do just that while saving 20 USD. And don’t worry, you won’t have to do any shady stuff at all. The simple trick is to use the so-called physique survey on the official website. The survey will contain a few questions that are designed to provide you with the program that best fits you. After completing the survey, your “reward” is a 20 USD discount. Follow this link to go to the survey (new browser tab). And that is how you save 20 USD! Q: What is Kinobody Greek God? A: It is detailed yet clear and concise workout and nutrition program designed to teach you how to efficiently transform your body into looking like a GREEK GOD! Q: Kinobody greek god results – what can be expected? A: You will get a strong and powerful upper body with sleek legs. You can expect to get significant strength gains and a dramatically different body in about 6-12 months. Q: Can’t you just send me the Kinobody greek god pdf for free? A: Greg put in a ton of hard work of trial and error to simplify and perfect this workout and nutrition program. So please consider supporting that work and if the price is too high there are tons of free programs out there. I can recommend the programs by Andy Morgan from Rippedbody.com. You can also check out my beginner’s guide. A: The superhero bulking program is for advanced lifters. As you become stronger and gain more muscle, the rate of muscle growth slows down and the techniques you want to use to continue growing also changes. That means if you still are a beginner to heavy weight training, then you will make slower progress with the superhero program. By the way, you can check out my review and journey with the superhero program here. A: Basically, the warrior shredding is a better choice if you are new to weight training and have a good amount of fat to lose. Following this program, you can burn fat and build a decent amount of muscle at the same time. Burning fat and building muscle at the same time is not possible?!? Although this has been proven wrong many years ago, you still hear this spoken sometimes. If your bodybuilder friend tells you that, then suggest him to read this article on Bayesian Bodybuilding. Hello there! My name is Marcus, I am a lawyer (LL.M.) and the founder of this website. Besides sometimes doing lawyer stuff, I like to write about fitness and health and share with others what I have personally found “works” (others have as well). I like weight training, yoga and figuring out how to overcome the many challenges caused by our modern lifestyle. If you want to know more about me and my vision for this website then you can click here. Question: Will the Greek God program help me lose fats while building dense muscle I don’t have to much fat but you consider me as skinny fat? The Greek god program will definitely help you build dense muscle! But it is recommended to lean bulk while doing it, which is about optimizing calorie intake to gain as much muscle as possible while keeping fat gain to a minimum. I am not so sure about fat loss. You could modify your nutrition and have a small deficit to lose a bit of fat. Maybe it could work if you only have a little to lose. But there are other programs that might be a better choice for you if you are serious about both building muscle and losing fat e.g. the warrior shredding program. You can check out my warrior shredding review here. That is a great comprehensive review! © 2019 Strengthery. All rights reserved.